Color me a sympathetic critic who recognizes that Yes fans will divide over this bold experiment. If nothing could have gone wrong, it wouldn't have been bold to try it. 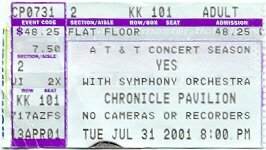 This MIGHT have worked if someone other than Groupe had orchestrated the pieces (someone with a greater affinity for the peculiar balances arising in even violent Yes sequences -- an orchestrator as attuned to Yes as, say, David Bedford was to Michael Oldfield, excepting that orchestra + rock group is even more challenging). Miscalculations in the score abounded, turning haunting passages in GoD ("listen...should we fight forever?...) into trite superficiality with interposed string pizzicati afterthoughts. Ending GoD with an effulgent, loud orchestral chord jazzed the audience, but on reflection, it spoiled the irenic intent of the original ending (not to mention that the original coda was more colorful (!) than the new orchestral one). The battle scene of GoD began as a confused rhythmic mess while the famous B-major chord hung suspended in mid-air. The timpanist apparently got lost (conductor Groupe's cheironomy -- his baton technique -- could use some work, especially given the inadequate rehearsal time accorded these pieces). CTTE seemed both muddy and sloppy, with the orchestra overlaying sonic embroidery of dubious value throughout (gilding the lily, as it were). I suspect others will point out the individual gaffes of our heros in other reviews (Alan White will surely come in for his share of embarrassment over his premature entrance during "In the Presence of," which he, ironically, co-wrote). 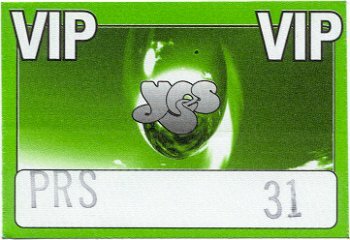 BTW, I first saw yes in 1975, then picked up with them again in 1998 and 2000. Hope one day they try to do Soundchaser live -- now, THAT would be REALLY bold! Okay, back to the review: vocals were well-performed, the mix appearing to improve throughout the night (perhaps not so much due to remixing the vocals as to adjusting instrumental balances against them). Keyboardist was no worse than Igor (if you closed your eyes), even with respect to balance issues, BUT when you opened your eyes, you couldn't help but realize that Igor was more authoritative at the consoles than Tom. There will never be a perfect Yes keyboardist (not even Wakeman, because he resists playing anything off of Relayer, which IMHO mars his suitability). I think they should bring back Moraz, but Jon and Chris haven't asked for my input on this (neither will they ask you yours, so I'd guess we're all even debating this old chestnut into the ground). Okay, final assessment: the road to Yessymphonic was paved with good intentions, but integrating orchestras and rock groups is a tricky business. They learned from ELP's experience not to bring an orchestra in tow (since that can bankrupt you pronto), yet fell short of achieving the integrations found in, e.g., ELP's "Pirates" (which is itself imperfect, but certainly closer to the ideal). I could be compelled to change my mind if a superbly mixed recording of Yessymphonic put all the balances right and shed more favorable light on roupe's handiwork -- but judging from this evening's results, I'll have to entertain doubt about that possibility. To whatever extent Yes played tighter than in Masterworks (which I caught in Hartford), it was overshadowed by synchronization issues with the orchestra. Don't paint me a cynic -- I flew to Concord from Austin to hear this. Yes played great, but the problem is simple to identify: "It's the orchestra, stupid." This could be fixed without dropping the orchestra, but I suspect that will take a LOT of work, and Groupe is probably not the one to handle it. Maybe Bedford, Godfrey Salmon, or, who knows, Michael Torke! Thank you so much. Thank you. It great to be [???] once again in Concord. Thank you so much. Hey it's great to be here in Concord, oh I already said that. Hope your having a good time already and..uh we're going to do a couple of new songs from the new album we've been working on. We finished..uh mixing it about two hours ago and it sounded pretty cool so we're going to do a couple of songs for you okay? This is our first week of touring the world. [???]. It seems to get [???]. Here's a new song its..uh about the ideal we tend beat ourselves up too much, you know? [???] That's the ideal of the song. It's called 'Don't Go'. [???]. During the course of making the album. We actually recorded the down in Santa Barbara. It's a lot of fun down there and..uh just one day Mr. Alan White came in and started playing the piano as he is known to do. He came up with this sorta lovely sorta melody and we eventually to it and wrote this song which is called 'In The Presence Of'. Thank you so much. Thank you. The album is called 'Magnification' and it will be coming out in September. I'd like to introduce you to this wonderful bunch of people behind us, this is marvelous. We'll call them the Yes Symphony tonight. Yes Symphony here. [???] from Larry Groupe. You shouldn't try that should they? [???] stupid [???] uh..actually..uh we met Larry Groupe, as we call him Larry [???]. We met him about three months ago. He came to..uh Santa Barbara and checked us out [???] and our musical style and incredible job orchestrating the album so..uh Larry. He sorta suggested that after we spoke with to him a few times we said 'Why don't you go out of tour with us? [???] 'Yeah I'd love to.' [???] pushed him toward the deep end on this next song with is called 'Gates Of Delirium'. Thank you so much. Thank you. You are absolutely wonderful. Thank you. [???] Intensity [???]. Thank you for that. When we were in..uh Switzerland some twenty years ago or twenty four years ago [???] and one of the songs is..uh sorta popped out one morning is this song. [???]. [???]. It's only week into the tour and I'm trying to figure out what to say. [???]. Thank you so much. We were..uh [???] started rehearsing again and we said 'well lets do this song' [???]. We haven't done it in about twenty years and..uh very much like..uh the beginning of the band we used to write a lot about..a lot about the environment and things. [???] it's only natural [???] that..uh song about [???]. The earth is so powerful. [???] The earth is being [???]. Check this out. [???]. This is a song called 'Perpetual Change'. Thank you so much. Thank you. I'd like to introduce you to..uh swell guy who came to see the band in New Jersey last year, came backstage to played to us. Fine guy, very fine keyboard player his name is Tom Brislin. I'd to do uh. Here's the story I came back from rehearsal months ago and..uh my beautiful soul mate Jane. She was playing this song full blast in the house it was just amazing. She just loves the song so much so this is a dedication. The song is called 'Ritual'. Chris Squire on bass guitar. Alan White on drums. I'd like to thank Larry Groupe and the symphony orchestra behind us. Thank you all. Thank you so much. We're going to a sing along to this next song and just enjoy yourself and dance a little bit. [???]. [???] you guys [???]. Thank you. I'd like to thank you all very, very much for coming along this evening. As I said earlier, this is our first week of the tour and tonight [???] and I think it's down to you guys. Thank you so much. Thank you so much. [???]. Here's a song called 'Starship Trooper'.